Motivational Interviewing (MI) is an empirically supported treatment that has been shown to enhance engagement and outcomes (especially long-term outcomes) for numerous clinical problems. It is a brief, client-centered therapy aimed at understanding and resolving ambivalence to change. MI has been shown to be effective in the treatment of addictions and numerous other health and mental health problems. This workshop will show you how to integrate MI techniques into your practice so you can help clients/patients identify the road-blocks that keep them stuck and enhance their motivation for change. Prepare to roll up your sleeves and work as this workshop is highly interactive. This novel program has recently been reconstructed to be consistent with the latest training innovation in our field, namely the concept of “Deliberate Practice”. Deliberate Practice is the method used to train everyone from musicians, to athletes, to surgeons and it is now being applied to psychotherapy training. It involves the use of repeated feedback to actual specific scenarios and simulations in order shape and improve trainee responding. You will learn through involvement in a variety of engaging exercises & will grow in your skills as you get feedback about how to respond to those often complex and difficult scenarios. Scenarios include ambivalence, resistance, and even client hostility/anger across a wide variety of clinical domains (anxiety, eating disorder, addictions, health behaviours, etc.). Emphasis is placed on using videotape and other exercises to slow down and break down the complex process between client and therapist to help you identify moment-to-moment markers of ambivalence and resistance and then brainstorm effective responses to enhance client engagement. Emphasis is also placed on managing your own emotional reactions in these challenging encounters. You will also have the chance to apply and extend your learning to manage specific scenarios and client resistance statements you have encountered in your own clinical work and unique context. We have even subjected this newly constructed workshop using deliberate practice methods to scientific scrutiny in order to assess (rather than assume) its actual training value. In a recent study, participants showed large increases in empathy and in MI-consistent responding to video vignettes of ambivalent, resistant, and critical clients from pre to post-workshop. They also showed improvements in their emotional reactions to difficult clients, including feeling more positive, less afraid, and less uncertain about how to respond to challenging resistant clients. Their overall satisfaction with the workshop was extremely high. 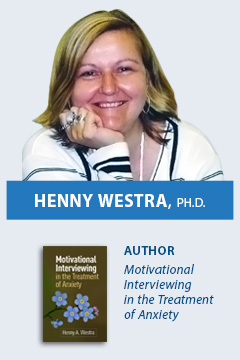 Henny Westra, Ph.D. is Professor in the Department of Psychology at York University in Toronto. Prior to this she was the Clinical Director of the Anxiety and Affective Disorders Service at the London Health Sciences Centre. She has published over 80 peer reviewed articles and book chapters, and given hundreds of presentations and workshops on MI. She is author of the book “Motivational Interviewing in the Treatment of Anxiety” and was also co-editor with Arkowitz, Miller and Rollnick on the book “Motivational Interviewing in the Treatment of Psychological Problems” which has been translated into eight languages. She has received funding from the National Institute of Mental Health and the Canadian Institute of Health Research for her research on Motivational Interviewing, resistance and interpersonal process in CBT. She is also a founding member of the Alliance for Process-Informed Psychotherapy which seeks to train a new generation of expert therapists through enhancing relational and process skills.